There isn’t a whole lot to dislike about these earbuds (it does lack a bit of fit and finish), but there is plenty to love, from sound and build quality to killer functionality. If you’re in the market for truly wireless headphones, you’ve probably seen the Jabra Elite 65t topping some “best of” lists around the internet. And that’s for good reason: they really are an impressive pair of headphones on a lot of levels. Like with anything at the top end of a price category, expectations are important here. If you purchase these with sky-high expectations, you might have some minor issues with the fit and finish. But from a sound quality and functionality perspective, the 65ts are rock-solid and will serve most people well, regardless of if you’re looking for workout earbuds or a pair of commuter headphones. Jabra is a brand that first made their presence known with single-ear Bluetooth headsets. So it’s natural to find a pair of true wireless earbuds from the brand, but what’s sort of surprising is to see the slight nod in design to those old single-ear Bluetooth peripherals. There’s a small, ¾-inch fin that holds some of the array microphones (we’ll get to those in a minute) and looks like a shrunken version of a headset. We tested a pair of Elites that Jabra is calling Titanium Black. They sport dark silver on the outside and matte black on the inside. This combo is our favorite because it’s unassuming, but you can pick up the 65ts in a bolder Copper Black or flashy Gold Beige. As a last point on the design: Don’t get hung up on the direction the word Jabra is listed. We’ll cover it in the Comfort section, but you’ll need to spin these up to 90 degrees to find the right fit for your ear shape. It’s a smart design, as the inner casing is ergonomically sloped to fit into a lot of ear shapes without the need for bendable rubber fins, but it makes things aesthetically questionable if your fit places the Jabra logo vertically rather than horizontally. The feel of the Jabra 65ts was arguably the most polarizing aspect of our testing. These are true wireless headphones, so chances are you’re already aware of the concerns here. If you don’t have a tight fit, you stand the risk of losing a single bud during a workout or when you’re out and about — we experienced a fairly traumatizing incident when we dropped the right bud and it rolled underneath a parked car. The trick is to place the earbud in your ear with the fin facing forward toward your face (let’s call it 3 o’clock) and then rotate it clockwise toward 6 o’clock. You’ll feel the bulging edge of the main housing slip into the pocket of your outer ear canal in a pretty clear way. For some people, this lands right about 4 o’clock. For others, you have to point the fin almost all the way down to 6 o’clock. This step is crucial both for stability in your ear and for sound quality. But, like with some other sports earbuds, this leads to a very tight seal. If you’re used to that, then this won’t be an issue, but if you don’t like the feel of eartips pressed very closely into your ears, this could be uncomfortable. The one thing most people won’t argue with is that the sound quality on the Elite 65t is great. Luckily, Jabra does include two additional rubber eartips (they call them EarGels) in the box. The largest is about half-an-inch in diameter, and the smallest is about 1/3rd of an inch. The middle size is the one that comes installed on the buds. Finally, the manufacturer puts the right headset at a weight of 6.5 grams and the left headset at 5.8 grams. This is a pretty impressive weight considering how much tech is packed in. Next to smartphones, headphones are probably the most knocked-around piece of tech we all own. They come with us on workouts, get jostled in our commuter bags and put through the rain-soaked ringer. The Elite feels very sturdy despite their weight. The earbuds themselves sport IP55 dust and water resistance — each of those numbers corresponds to the level for dust- and water-proofing, respectively. What that means in layman's terms is that the earbuds will be protected against limited dust and against low-pressure water spraying (think: your standard kitchen sink) from every direction. This isn’t quite the gold standard (IP68) we’ve been seeing in recent generations of smartphones, so be sure to avoid submerging these in water and rubbing the headphones in dirt. Jabra seems to stand by the rating as they’re offering an automatic 1-year warranty, with the option to extend to 2 years of dust and water resistance by registering via the app. The only negative of the set here is the battery case. It’s built of a matte, plasticky material that does protect the headphones, but doesn’t feel premium. The hinged lid for the battery case is awkward to open, requiring a specific angle of force. It’s a shame because this really does detract from the experience, making it somewhat easy to jostle the earbuds (possibly even knocking them out) when you have to force it open. The one thing most people won’t argue with is that the sound quality on the Elite 65t is great. From the spec sheet: the speakers cover frequencies from 20Hz to 20kHz, the speaker driver is 6.0 x 5.1mm, and the whole housing employs an acoustical open chamber design. This means that even though the earbuds tend to sit pretty far into your ear canal, they manage to sound a bit more open, rich and lifelike. The 16-ohm speaker impedance and the 103dB SPL make for plenty of volume and great support on the driver side. Plus, the Bluetooth 5.0 and the AAC codec support means you’ll get almost as much quality as wired earbuds. If you can afford the premium price tag, you really won’t be disappointed. The other piece of the puzzle here is the microphone array. Yes, the voice quality on phone calls works as great as you’d expect from a brand like Jabra that’s made its name on Bluetooth phone call peripherals. But the four microphones also offer some ambient noise reduction (pretty basic, in our tests) and the ability to filter in some ambient noise if you want to hear your surroundings. These MEMS microphones (that acronym basically just means they’re tiny, fabricated using semiconductors) are super small and super precise. Though, it’s important to note here that when you do let some of the noise in, it can be a little sharp and grating because of all the detail. Outside of sound quality, battery life is really one of (if not the) most important spec of Bluetooth headphones. This is especially true with true wireless earbuds, because if you’re out of battery then you have no recourse. The earbuds promise about five hours of battery life, which is pretty close to the competitors, and we found this to be largely true. That said, when we used heavy microphone features, like ambient noise pass-through and phone calls, it was closer to four hours. The battery case itself is where the 65ts fall short. You only get 10 additional hours of battery with the 500mAh case, whereas something like the Apple AirPods will give you about double that. This is surprising because the case itself is so much bigger than the AirPods’ charging case. 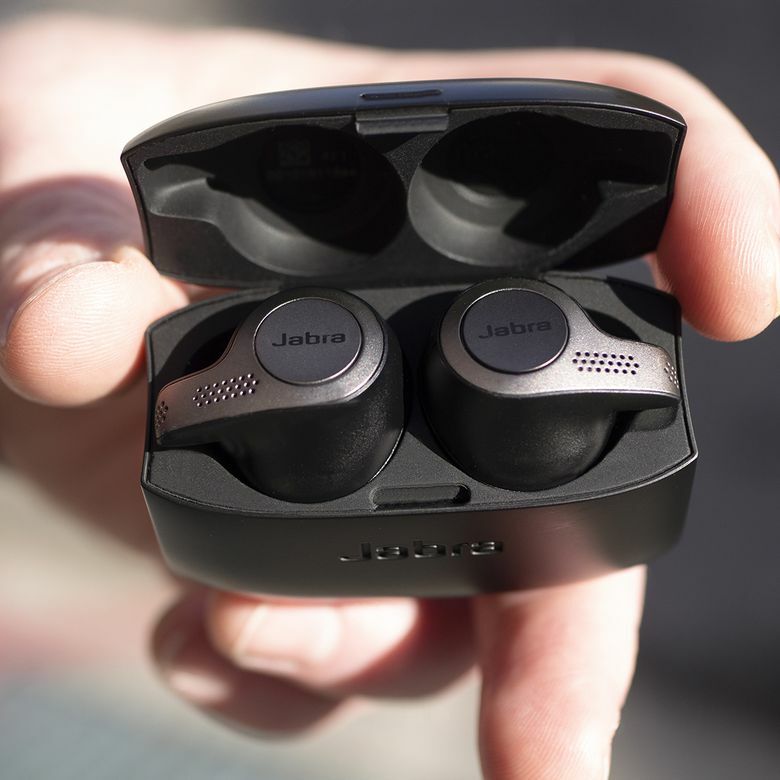 When compared to the Bose SoundSport Free — another key competitor — the Jabras are dead even. What’s refreshing here is that that 65t battery life seemed very close to these quoted totals in our real-world tests. If you do find yourself out of juice, you can recharge the full set in 2 hours using the micro USB cable that’s included. These totals aren’t turning a ton of heads, but the numbers advertised on the box are pretty accurate, a fact we love to see. When a pair of Bluetooth earbuds have great connectivity, you don’t even really notice it. The 65ts don’t have any crazy convenient bells and whistles like AirPods do, nor are they plagued with skipping and connection dropouts like the lower-priced options. In our more than 20 hours of testing, we counted less than three or four noticeable skips and idiosyncrasies. One point to consider—we did notice some latency when it came to watching videos (common with true wireless buds), but powering the left earbud on and off seemed to fix this issue most of the time. Compared to virtually all the other competitors in the space, the Jabra Sound+ app is a huge selling point for these earbuds. First, the software lets you easily connect and learn more about the earbuds — an important fact, because some of the onboard controls aren’t overly intuitive. You can also toggle the ambient noise amplification to let you hear your surroundings (Jabra calls this HearThrough). There’s a very standard EQ with some solid presets — “smooth” tended to be our favorite. What’s more, you can take all of these options, and assign them to different moments of your life, creating a setting preference for default, your commute, and work/focus time. You can mix and match the controls, (Jabra calls them widgets), and you can even mix some ambient wave sounds right from the app. It’s a really intuitive package without being overly complicated, though we do wish there was a non-mobile equivalent for your computer. The truth about the pricing here is that these are expensive, but not otherworldly. The list price on the Elite 65t is $169.99, putting it just a bit more expensive than Apple’s AirPods. This is important to consider because when headphones are more than that, you have a right to expect a flagship product. For the build and sound qualities alone, we think the price is fair, but some shortcomings (like the plastic case and the slightly finicky fit) might make these feel less premium. There has been a veritable flood of “true wireless” headphones that has become much more prevalent this year. The Elite 65t came out early in 2018 alongside the Elite Active 65t, which fold in better IP ratings and a built-in accelerometer for workout tracking. But, in our eyes, there are two real competitors. Compared to virtually all the other competitors in the space, the Jabra Sound+ app is a huge selling point for these earbuds. For convenience, premium build quality, and brand recognition, the Apple AirPods are a natural competitor here. If you want earbuds that fold easily into your iOS ecosystem and don’t care much about full, substantial sound quality, then the AirPods are for you. But if sound quality and a sportier look are a priority, get the 65ts. There are a few other audio-centric true wireless earbuds out there, but none garner the features and brand recognition quite like Jabra and Bose. To our ears, the Bose SoundSport Free sound very similar to the Elite 65t, though we found the Elite to be substantially louder. You also get better microphone features and a better IP rating (IP55 vs IPX4 on the SoundSports). But the fit feels more natural on the SoundSports, so it ultimately comes down to your priorities. Want to see some other options? Check out our list of the best wireless headphones and the best true wireless earbuds. If you can afford the premium price tag, you really won’t be disappointed. There are some quirks, like the slightly rickety case and the learning curve associated with the fit. But, these headphones check pretty much every other box, and any workout regiment or commuter bag would be all the better for having these there. Product Dimensions 1 x 2.25 x 1.75 in.